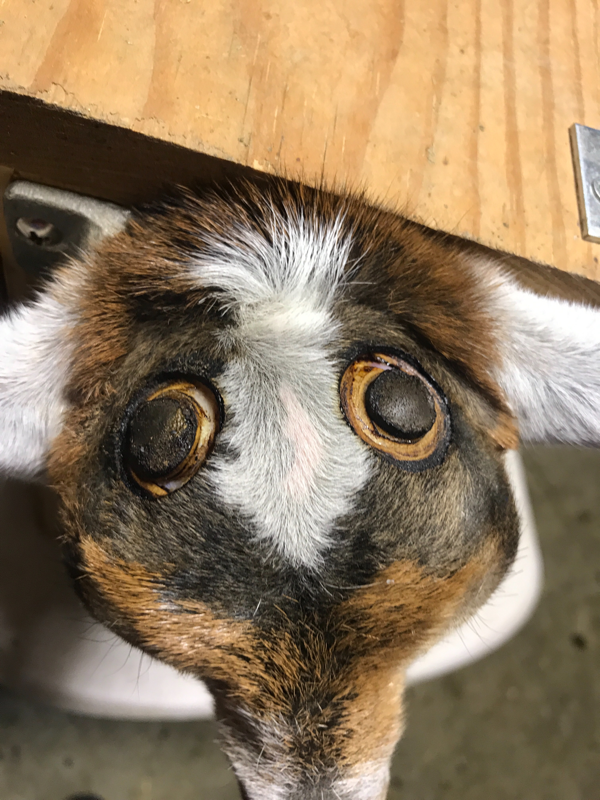 Disbudding of dairy goats is very important for the health and safety of the goats and the humans who love them, especially children. Horns do NOT protect goats from predators (that's what Livestock Guardian Dogs are for!) and horns can get caught in fences, injuring or killing the goats and allowing predators to attack them. Goats with horns often accidentally hurt each other, their humans, especially children, and other animals around them. 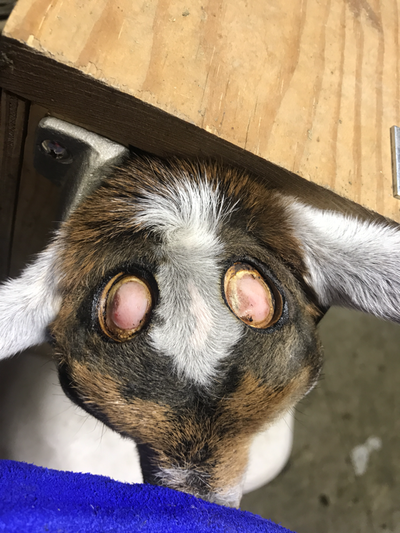 Dairy goats are NOT allowed to be shown with horns and dairy goats with horns are less likely to have a long, happy life in a good home and more likely to be abused and mistreated by someone who thinks it's "funny" to tease the horned goat. 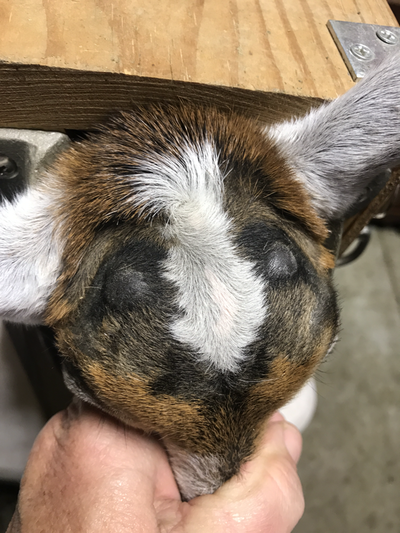 Occasionally you will see goats on our farm and website that have "scurs" which are disfigured horns from an improper disbudding job. (Most are goats we bought that someone else disbudded improperly but a few are our own failed attempts. It happens to us all.) Nigerian Dwarfs and, to a lesser degree, Mini Nubians, are THE hardest goats to disbud properly. This is because their horn base is very wide and the cells inside it are very tenacious, especially on bucklings. You can't disbud these breeds with the same methods (Copper Ring Method) that's used on standard sized goats! The horn cells aren't completely destroyed and some amount of horn can continue to grow, often in a crooked and odd way. 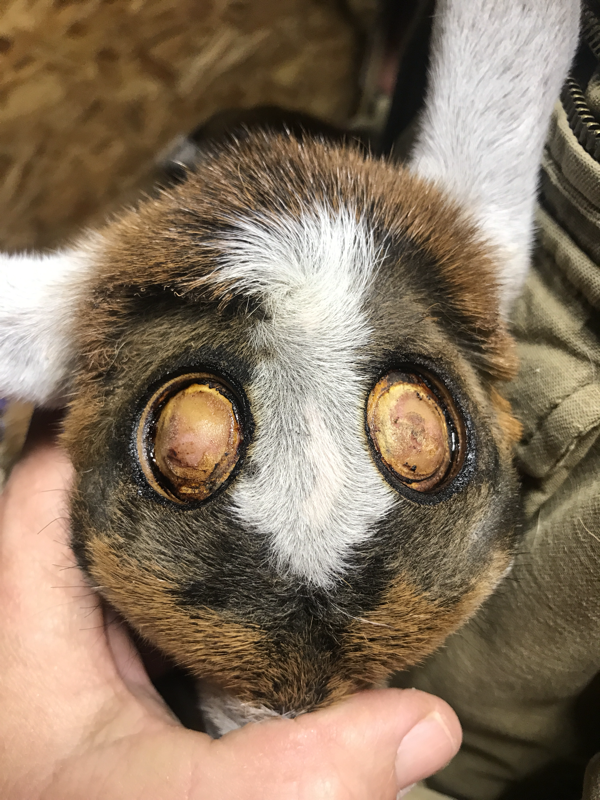 On does it's doesn't usually amount to much but on bucks they can get quite large and may need to be trimmed occasionally to prevent problems such as curving into the goat's head or neck. It seems that very few people disbud these miniature goats properly but yet they keep doing the same thing over and over! Or they aren't aware that they are causing scurs because some scurs take time to develop. We can't and don't guarantee that all of our kids will be scur free but we will continue to perfect our technique and hopefully the scurs will be fewer and far between. One day we may make a video or tutorial of how we disbud but for now these links below show exactly how we do it and are the method I highly recommend. I also recommend the proper tools and a helper. My helper is my teen son. It was 12 when he started and it was a tough job for him to learn to do, being a sensitive kid who didn't want to hurt the babies. It was tough on ME having him help, too! I felt bad for him and the goats. I kept apologizing to them both! But now it doesn't really bother him because he knows it will be quick and then the goats will be happy little campers again. Eventually he'll probably be able to do it himself. We use a Rhinehart x-30 with a 1/2 inch standard tip. Do NOT use the Pygmy tip, it's too small! (We also have an X-50 but don't like it. Too clumsy.) The iron is heated until red hot and allowed to reheat properly between kids. We do barn chores between kids, as well as shaving each kid’s head one at a time, to allow the iron to reheat and we only do a few kids a day. We do it when they need to be done, we don't do big "batches" of kids. These two steps are vitally important. Each kid needs to be done when they are ready - not too early or to late. You want the kids healthy and strong and big enough to handle the process, but you don’t want to allow the buds to get too big. This is usually just a few days to a week old for bucks and 5 days to a week or so for does. If someone tells to to wait 2-3 weeks or more they are wrong and you’ll likely get scurs. People who wait to do all the kids in big batches risk scurs and they risk giving the kids brain damage. It’s vitally important that the iron is allowed to properly reheat between kids, because an iron that isn’t hot enough has to be held on for too long and that is dangerous for the kids. We try to just do 2-4 a day and we let the iron heat for 30 minutes or more to start and at least 15-20 minutes between kids. Plug the iron directly into a socket, if possible, not into an extension cord. We test it on a piece of wood and also check to see that the tip is cherry red before we use it. (Turn off the lights to see it!) Putting the iron down into a metal bucket or coffee can helps it heat better and stay hot. Then I go back and cauterize any oozy spots and touch things up by placing the iron directly right down into the opening left by the caps being removed. I take my time on this, to make sure it’s done right. You don’t have to get it completely copper because you already went past the copper stage, but you don’t want it weepy or bleeding or too pink. You want it dry and nicely sealed and cauterized. When I was learning to disbud I had people who only do the copper ring method telling me that I hadn’t done it right because the area wasn’t all golden, but they were wrong. (I was really stressed out until I realized they didn’t know what they were talking about.) The methods are different so the results look slightly different. Everyone has to do what they feel is best for their goats but I feel this method really reduces the chance of scurs and is more efficient and less painful to the kids. If the kid is a doe she’s done. If it’s a buck I do a figure 8, because they have a wider, more triangular horn base and will get scurs if you don’t take this extra step. This takes practice, too. Basically you're overlapping towards the front and slightly inward, towards the nose. (Sometimes I even draw around the area with a sharpie after I shave the head so I can see it better, especially on spotted kids.) You’ll flick the cap off of this, too, but it will be easier but not likely look quite as neat as the first burn. That’s ok, the point is to kill those tenacious little horn cells! In time they’ll look neater, as you get comfortable with the method. Step by step illustrations of our method. Disbudding box from Caprine Supply or Hoegger Farmyard, or home made. We have one of each, the smaller one from Hoegger Farmyard for Nigerians and the one from Caprine Supply for Mini Nubians, but we use the metal headpiece from Caprine Supply on both. An excellent disbudding tutorial from Zanzabee Nigerians. 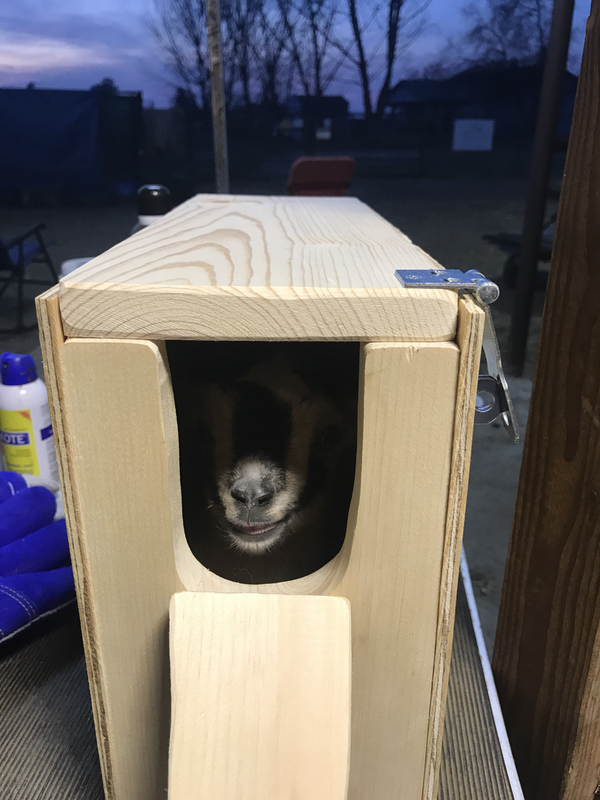 Disbudding tutorial and video from Green Gables Mini Nubians.